30% Renewable Energy in Alberta by 2030: Where are we now? 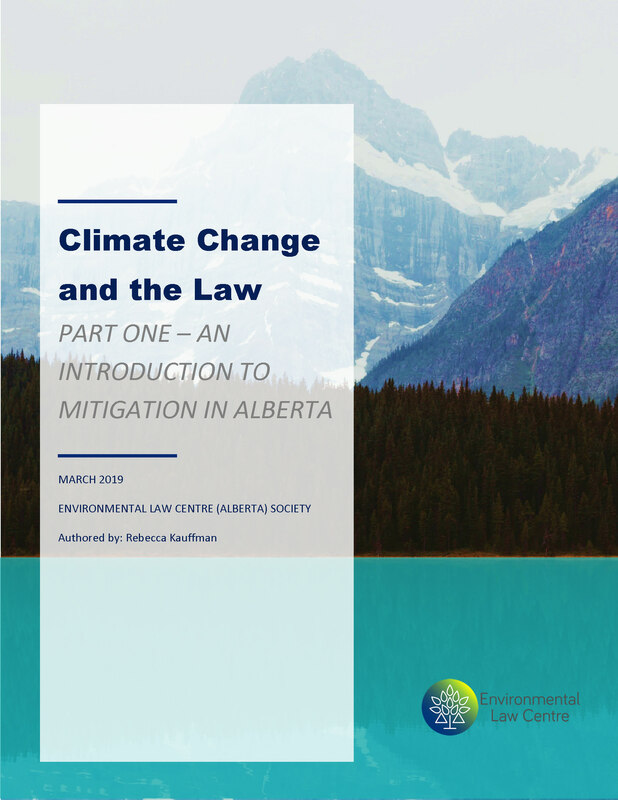 The Environmental Law Centre (ELC) recently published its report on Climate Change and the Law which consists of two parts: Climate Change and the Law: An Introduction to Mitigation in Alberta and Part Two – An Introduction to Adaptation in Alberta. Part One introduces readers to the idea of mitigation and how it can help Alberta meet its climate goals. Part Two provides a broad overview of the issues Alberta is likely to face due to climate change and the legal tools and measures that can assist with adapting to these issues. This blog post is part of a short series that highlights and features select excerpts from the report. Climate change, and what to do about it, is a daily news headline with debate occurring at the local, provincial, national and even international level. Our two-volume primer on climate change takes a broad look at Alberta and its role in these debates. The first volume and accompanying blog series will focus on mitigation. When it comes to mitigating the effects of climate change, we have many options, ranging from opting for less energy intensive goods or eating local foods, to investing in carbon capture technology. However, for our purposes, the first volume of this report will focus on lowering GHG emissions through increased energy efficiency and a transition away from fossil fuels towards renewable energy. The crux of the push towards energy efficiency is that right now our buildings, our appliances and any other energy using products are using, and ultimately wasting, more energy than is necessary. For example, commercial buildings are responsible for more than 40% of energy use across Canada. The majority of government response to this overuse has been to increase regulations and standards for energy loss and usage. The mitigation primer will provide readers with an introduction to some of these regulations. One example is the Alberta Building Code which was updated in 2016 to raise the energy efficiency standards for new builds. In the meantime, the federal government is also in the process of releasing its new Major Energy Retrofit Guidelines catered to specific categories of buildings. Appliances, and other energy using products, are also a focus. To regulate these products, the federal Energy Efficiency Act, SC 1992, c 36 and its associated Energy Efficiency Regulations, 2016, SOR 2016-311 set certain energy efficiency standards that must be met by all energy using products – from your fridge to your furnace. Beyond command and control regulation, a big step towards increased energy efficiency came in the form of the newly legislated Alberta PACE program – for more information you can find two of our other blogs on this topic “Picking up the PACE and Running with City Charters: An Update on Municipal Government Act” and Keeping up the PACE: An update on the Pace Program and Associated Regulations). PACE programs enable municipalities to issue loans to property owners interested in making energy efficiency upgrades to their home or commercial building. These programs are designed to lessen the cost of upgrades and renovations, allowing a municipality to pay any upfront costs and then add the repayment program onto the property owner’s property taxes. The goal of this program is to make energy efficient renovations and upgrades more accessible for everyone. Information about the PACE program, along with other provincial programs and incentives, can be found in the first section of our Mitigation Primer. In conjunction with an overview of energy efficiency programs in Alberta, much of the Mitigation Primer focuses on the slow transition currently underway from fossil fuels to renewable energy. Renewable energy is defined by Natural Resources Canada as “energy obtained from natural resources that can be naturally replenished or renewed within a human lifespan, that is, the resource is a sustainable source of energy.” To narrow down this definition, the Mitigation Primer focuses on five types of renewable energy: solar, wind, geothermal, bioenergy, and hydroelectricity, and evaluates the regulatory regime currently in place in Alberta for each of these types of renewable energy. The Climate Leadership Plan and its goal of 30% renewable energy by 2030 has been somewhat of a catalyst in encouraging a transition towards renewable energy. Yet, despite this, renewable energy capacity is still quite limited across the province. In conjunction with political stagnation and the high costs that come with installing new energy infrastructure, the transition to renewable energy is also negatively impacted by a lack of regulatory certainty and, in the case of geothermal, a lack of any regulatory regime at all. It is this regulatory system that will be the focus of this primer. Today, solar is becoming one of the most popular types of renewable energy in the world. China is building giant solar farms, India is planning to build the world’s largest solar-wind hybrid park, and Germany, an early leader in solar technology, has now reached 45 GW of installed photovoltaic capacity. It is also starting to pick up some steam in Alberta, a new solar project planned for Fort Chipewyan will be the biggest solar project in Canadian history and will consist of about 7,500 solar panels. Luckily for future solar projects, solar energy in Alberta has a relatively robust regulatory system. Large-scale solar energy projects are governed primarily by the Hydro and Electric Energy Act, RSA 2000 c H-16. This Act sets out the regulatory process required before approval of any commercial solar farms – the process is similar to the approval of other energy generating plants. For small-scale solar projects, the Micro-Generation Regulation and the Small Scale Generation Regulation govern the relatively simple approval process. To read more about the Small Scale Generation Regulation, check out our blog here: New Small Scale Generation Regulation aims to fill the gap between micro-generation and large utility companies. Although these two regulations apply to all types of renewable energy, solar may be the most practical because solar panels (as opposed to a geothermal wells for example) may be the most viable option for homeowners or other smaller-scale property owners looking to venture into renewable energy. Although the regulatory framework for the installation of solar is more flushed out than it was a few years ago, the issue of a ‘right to sun’ may be the primary issue for homeowners in the coming years. The right to sun debate contemplates a situation where a neighbour builds their home or building in such a way so as to interfere with a previously installed solar collector, forcing the owner of the solar collector to resort to the traditional electrical grid for their energy needs. How can the owner of the solar collector ensure they retain solar access? Currently, there is no legislated right to sun in most municipalities in Alberta, however, the town of Millet has incorporated a right to sun into its municipal bylaws – ensuring that the choice to install solar panels will not be a wasted investment. A future blog will focus on the ins and outs of enforcing a right to sun. The wind turbine industry is another fast-growing renewable energy industry in Alberta. For example, in 2017, the Alberta Electric System Operator put out calls for renewable energy companies interested in producing electricity for the province to submit bids. In order to qualify for this first round (rounds 2 and 3 have also now been awarded) projects needed to procure 400 MW of renewable electricity capacity; be operational by 2019; be equal or greater than five MW; meet the Natural Resources Canada definition of renewable energy; and utilize existing transmission systems. Numerous bids came in, but in the end the four projects that were chosen were each wind projects, coming in at a record low price of $37 per megawatt-hour. The mitigation primer takes a closer look at the wind energy industry in Alberta today, including legal considerations specific to wind turbines, such as smart siting for birds and bats and liability issues. Geothermal energy is a particularly unique form of renewable energy because, unlike solar or wind, it is a baseline energy source. This means that it is not reliant upon intermittent energy sources, such as sunlight, to create energy. Rather, geothermal has the potential to produce power 24 hours a day, seven days a week. In addition to this, the Canadian Geothermal Energy Association – an organization that lobbies for increased geothermal energy production in Alberta found that, across the province, there are about 500 well sites suitable for power generation; 7,200 well sites suitable for industrial heat; and 53,000 well sites suitable for direct heat – demonstrating significant geothermal potential across the province. However, despite all of this geothermal potential and the number of highly skilled workers with experience in drilling and resource extraction, there is still no commercial geothermal in Alberta – in direct contrast with Saskatchewan, where Canada’s first geothermal power plant is currently under construction. One of the obstacles facing Alberta’s geothermal industry is the lack of regulatory framework. Unlike other renewable energy sources discussed in this primer, there is no specific reference to geothermal in current legislation, nor have any directives or government policy been released on the subject. Although the lack of regulatory framework does not prevent geothermal, the lack of certainty and clear procedure discourages investors from making the high up-front payments required for geothermal exploration and testing. Unlike solar or wind projects, choosing a spot for a geothermal well is critical for its success and without testing, initial investments may come back empty handed. This risk, coupled with regulatory uncertainty, has made geothermal an unattractive option in Alberta. This is particularly unfortunate due to the possibility of rehabilitating thousands of orphaned wells across the province as geothermal wells. Not only would this create a viable geothermal industry but it would also lessen the job for the overworked and underfunded Orphan Well Association – the association currently responsible for cleaning up and remediating orphaned oil and gas wells. Stay tuned for an upcoming blog post that will take a closer look at how we could regulate geothermal in Alberta. We will also be publishing a full report on the regulation of geothermal in the coming year. Bioenergy involves burning biological materials, such as wood waste, to create energy. However, despite this seemingly simple procedure, the increased use of bioenergy comes with particular risks. Most notably for the purposes of this primer, bioenergy is only considered to be a renewable source of energy if the fuel source is replenished faster than it is burned. For example, cutting down old growth forests to be burned for bioenergy would not be sustainable nor should it be considered a renewable energy resource. In contrast, creating sustainable bioenergy plantations, using brackish water and previously contaminated land would be a renewable way to increase bioenergy usage. In 2017, the Pembina Institute released a “New Energy Map” which highlights clean energy projects in the province – including bioenergy. This map notes that the majority of bioenergy projects are confined to power plants, pulp mills, and landfills. For example, in Slave Lake, the pulp mill constructed an energy plant that uses the mill’s effluent, in the form of wastewater, to produce energy. Hydroelectricity is one of the oldest forms of renewable energy in Alberta – the first dams were built back in the 1950s and some of them are still operating. This long history means that hydroelectric projects are highly and specifically regulated, including provincially, under the Hydro and Electric Act, the Environmental Protection and Enhancement Act, and the Water Act and federally, under the Navigation Protection Act and the Canadian Environmental Assessment Act, 2012, among others. In addition to these statutes, hydropower projects require an environmental assessment prior to approval, a step which creates an extra regulatory burden. However, even with this extra step, the approval process for hydroelectric projects is relatively streamlined, largely due to the well-established regulatory process. This process reduces uncertainty for investors and makes it easier to get new projects up and running. There are two main types of hydroelectric projects: reservoirs or run-of-river projects. Reservoirs require flooding a large area of previously terrestrial land to create a basin of water which can be pushed through a dam to create on demand energy. Run-of-river, in contrast, channels a portion of a river through a generator, while still allowing the river to remain relatively free-flowing. Despite being ‘clean’ energy, the more we study reservoir hydroelectric projects, the more we have learnt about their environmental impacts, impacts which will be outlined in the Mitigation Primer. In addition to these negative environmental impacts, hydroelectric projects are facing increased competition, as other sources of renewable energy become less expensive. The fact that the majority of easily accessible hydroelectric locations have already been developed – leaving only more remote and therefore more expensive options – along with a focus on the environmental consequences associated with hydroelectric projects has meant that recent applications for new hydro infrastructure have not resulted in shovels in the ground. In fact, two hydroelectric projects proposed by Innergex, were terminated at the request of the project proponent. This section of the primer will take a closer look at hydroelectricity and discuss some of the challenges associated with what used to be known as a best case scenario for electricity production. Alberta is still known as an oil and gas province, however, despite the accuracy of this reputation, Alberta has seen some movement forward in the realm of renewable energy. Ideally, increased reliance on renewable energy will help to mitigate the effects of climate change, but in the meantime, we must also begin taking steps to adapt to the climate change impacts that have already begun. Keeping this in mind, an introduction to adaptation in Alberta will be found in next week’s blog post , stay tuned. Natural Resources Canada, “About Renewable Energy” (29 June 2016) Government of Canada online: http://www.nrcan.gc.ca/energy/renewable-electricity/7295#what. Government of Alberta, “Climate Leadership Implementation Plan 2018-19” (June 2018) online: https://open.alberta.ca/dataset/da6433da-69b7-4d15-9123-01f76004f574/resource/b42b1f43-7b9d-483d-aa2a-6f9b4290d81e/download/clp_implementation_plan-jun07.pdf. Chris Baraniuk, “How China’s giant solar farms are transforming world energy” (4 September 2018) BBC News online: http://www.bbc.com/future/story/20180822-why-china-is-transforming-the-worlds-solar-energy. Saurabh, “India’s Adani Plans World’s Largest Solar-Wind Hybrid Park” (28 January 2019) Clean Technica online: https://cleantechnica.com/2019/01/28/indias-adani-plans-worlds-largest-solar-wind-hybrid-park/. L. Michael Buchsbaum, “German solar hits its 2018 targets” (28 December 2018) The Global Energiewende online: https://energytransition.org/2018/12/german-solar-hits-its-2018-targets/. Alberta Native News, “Solar Power Project Aims To Reduce Reliance on Diesel in Fort Chipewyan” (7 February 2019) Alberta Native News online: http://www.albertanativenews.com/solar-power-project-aims-to-reduce-reliance-on-diesel-in-fort-chipewyan/. Alberta Electric System Operator, “Participate in the REP” (2016) Government of Alberta online: https://www.aeso.ca/market/renewable-electricity-program/first-competition/. Fuzeium, “Alberta’s Geothermal Potential” online: https://fuzeium.com/geothermal-co-production-study/?report=0. Sarah Rieger, “Canada’s 1st geothermal plant is being built in Sask., but why hasn’t the industry taken off in Alberta?” (21 January 2019) CBC News online: https://www.cbc.ca/news/canada/calgary/alberta-geothermal-potential-1.4986104. National Energy Board, “Canada’s Adoption of Renewable Power Sources – Energy Market Analysis”. Canadian Environmental Assessment Registry, “Pelican Renewable Generating Station Project” (14 February 2018) Government of Canada online: http://www.ceaa-acee.gc.ca/050/evaluations/proj/80145?culture=en-CA; Canadian Environmental Assessment Registry, “Sundog Renewable Generating Station Project” (14 February 2018) Government of Canada online: https://www.ceaa.gc.ca/050/evaluations/proj/80146?culture=en-CA.